Retail landlords often include in their form leases a requirement that tenants periodically remodel their premises (remodeling requirement). Each party should know how to negotiate the remodeling requirement in a commercial lease. Read the full article published in Probate & Property magazine (American Bar Association). KPPB LAW Associate Josh Crowfoot co-authored the article and serves as vice-chair of the ABA’s Retail Leasing Committee and editor of the Young Lawyer’s Network for Probate and Property. 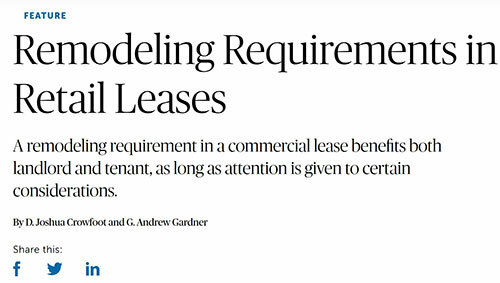 This article is a follow-up to Josh’s panel discussion about retail commercial leasing topics during the ABA’s Real Property Trust & Estate Section’s Spring Conference in Orlando.